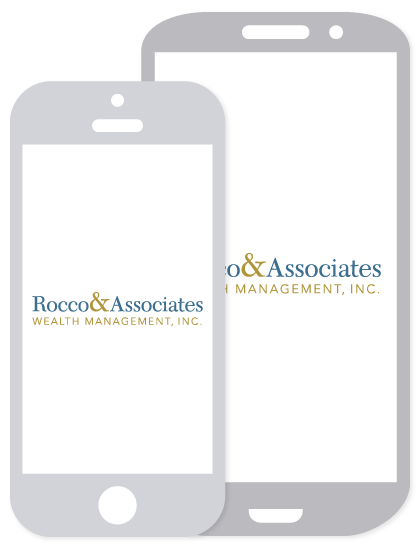 Market Outlook - September 2017 | Rocco & Associates Wealth Management, Inc.
September is finally upon us! School has begun and the leaves will soon begin to change. As fall starts to set in we want to discuss potential sources of stability in the upcoming months. First, we will touch on the possibility of fiscal policy will come out of D.C. Second, we will examine the effect of international investors on the U.S. Treasury bond markets. And finally, we will explore the potential to diversify portfolios through international investing. With our continued outlook being cautious, we are seeking out stability in an unsure future. After the election, it was unclear how fast new fiscal policy would be introduced on the hill. Recently it has become increasingly clear that here are many hurdles that need to be overcome in D.C. before that can happen. The debt ceiling and spending authorization are just two examples of pressing issues that need to be addressed before tax reform or budget cuts will be enacted. However, it is often said that no news is good news. Hopefully this is also true for fiscal policy. Over the past several years, U.S. government debt has seen an influx of international investors. Some of the top investors in U.S. debt include Switzerland with $235.2 billion, Ireland with $271 billion, and Japan with $1.137 trillion as of October 2016. U.S. Treasuries are appealing to foreign investors because they are considered some of the more stable investments in the world. Further, with interest rates at historic lows in Europe and Japan it is one of the only sources of lower risk yield left globally. Some theorize that this inflow from abroad has kept the 10-year treasury yield flat, even though the Fed has raised rates repeatedly this year. 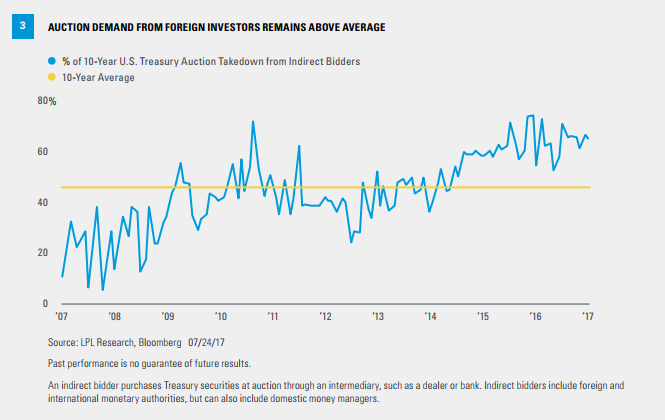 The graphic below illustrates this point, showing that foreign demand remains above average for 10-year U.S. Treasuries. A final source of potential stability may come from diversifying portfolios internationally. Year-to-date the European stock is up 18%; the Indian stock market is up 19% and China’s stock market is up 23%. 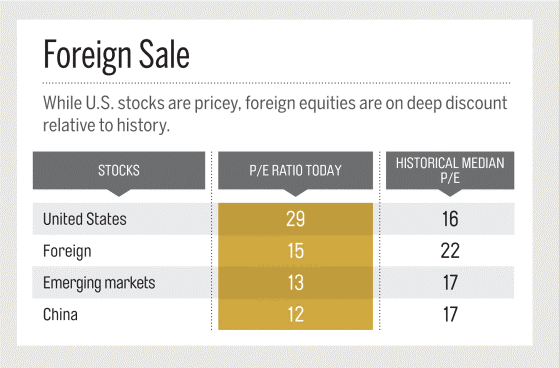 After a long history of international markets underperforming U.S. markets, we could start to see things even out. Additionally, having foreign currency exposure in a portfolio may mitigate the impact of inflation. The icing on the cake? Even with this recent run up across international markets, most are priced lower than their historical medians, as illustrated by the chart below based on P&E ratios as of June 2017. The P/E ratio (price-to-earnings ratio) is a measure of the price paid for a share relative to the annual net income or profit earned by the firm per share. A higher P/E ratio means that investors are paying more for each unit of net income, so the stock is more expensive compared to one with lower P/E ratio. At Rocco & Associates, we continue to exercise caution as we proceed forward. However, we’ll also continue to search for potential sources of stability in the markets. Your team at would like to remind you that your plan takes these various factors into account. As always, if you have any questions or concerns, or you would like to review your plan in more detail, don’t hesitate to reach out!